This shaggy-haired chap with the moth equivalent of torn jeans was a new arrival in the trap last night - a Common Swift, I think. (But I am wrong. It's a Pine Beauty - many thanks to Paul in Comments). Along with the Common White Wave, below, he brings my tally for the first month of trapping at our new home to over 40 species. Both of these moths have to put up with the word 'common', which used to be a terrible put-down in my grandmothers' day, but they are actually very attractive in their different ways. (Indeed, my error rather underlines this point even though the commonality of 'common' now no longer applies. The Pine Beauty is not unlike the Common Swift, at least to my fading eyes). There's a lot of talk on moth-related websites about the poor numbers so far this year, following a long and dreary winter, and that has been reflected here as I make my first audit. Observe the effects of wet weather on our kitchen: the ceremony of Drying the Eggboxes. The decline applies to overall totals, though, rather than the range of moths which have come to the light. I'd been hoping for novelties as part of our move from Leeds and I have not been disappointed. Here's the full list, with moths new to me in red, and with some pictures of other visitors last night - a White Ermine, a Brimstone, a Clouded Silver and a Bright-line Brown-eye on our rhubarb (like the Common Wave). There was also a Poplar Hawk, an Iron Prominent, a Shoulder Flame and at least a dozen Green Carpets plus one or two other carpets and pugs which fluttered away while I was busy with the two commoners. Macro-moths: Bright-line Brown-eye, Brimstone, Brindled Pug, Chocolate Tip, Cinnabar, Clouded Border, Clouded Drab, Clouded Silver, Common Quaker, Common White Wave, Early Grey, Early Thorn, Early Tooth-striped, Flame Shoulder, Green Carpet, Hebrew Character, Iron Prominent, Least Black Arches, Lesser Swallow Prominent, Muslin, Nut-tree Tussock, Pale Pinion, Pale Prominent, Pebble Prominent, Pine Beauty, Poplar Hawk, Powdered Quaker, Red Twin-spot Carpet, Rustic Shoulder-knot, Shuttle-shaped Dart, Small Quaker, Swallow Prominent, Twin-spot Carpet, Twin-spot Quaker, V-pug, Waved Umber, White Ermine, Yellow-barred Brindle. You are pulling down the pillars of the world, George Fox! Rain stopped play last night but I am a day behind and haven't reported yet on Tuesday night's arrivals, which were interesting. Although it was damp, two graceful Swallow Prominents were perched on the lamp flex, a Brimstone moth was lurking in the long grass nearby and there was one new visitor and possibly two. The definite novelty is this Shuttle-shaped Dart, at the top, with its distinctive wing markings named after the weaver's shuttle. Being from the West Riding, I have one of these at home - the famous flying shuttle which is spectacular (but very noisy) to see in action. Here it is, above. The moth was a regular visitor in Leeds as well. Textiles were big in my new, Oxfordshire surroundings too, especially in the Cotswolds where the 1870s majesty of William Bliss's woollen mill at Chipping Norton rivals even mighty Saltaire, formerly on my doorstep. As I endlessly remarked of the 'grim North' image during my Guardian years in Leeds and Manchester, people can hold very false impressions of different parts of the UK. On my new doorstep, for example, the now-serene, deserted village of Hampton Gay with its beautiful farm, handful of cottages, ruined manor house and lonely church in a field, housed a busy (and noisy and dirty) paper mill until the late 19th century, employing more than 80 people. I'm less certain about the identity of this second moth with its beautiful mix of pink and brown which is clearer if you double-click on the picture. I think I've recorded it in Leeds but can't track it down. It has elements of all manner of candidates from the Common Rustic (which flies later in the season) to the Brick and the Suspected, but I think after a long time of frustrated scanning of my books and online that it is probably just a rather beautiful Common Quaker. (And guess what? I guessed wrong. It's a Rustic Shoulder-knot - many thanks to Tony P in Comments). 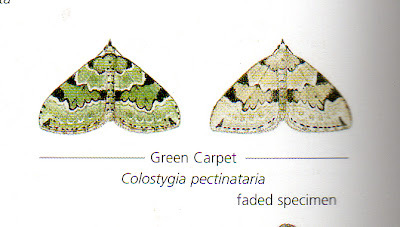 A footnote to yesterday's post: the 'carpet' which I thought had fluttered off had only got as far as a different eggbox, rather a rain-sodden one, and here it is: not a carpet but (I think) an Early Tooth-striped. Lurking nearby was another escapee, a classically faded Green Carpet. I ay 'classically' because green is not a colour which lasts in moths. The various Emeralds, for instance, lose their lustre very quickly and become dowdy like spinsters in Victorian novels. The phenomenon is so striking that Richard Lewington actually illustrates a faded Green Carpet in my Moth Bible. Here it is, alongside a painting of a fresh one. Meanwhile, a belated note about a lovely walk which Penny and I took on Sunday - along the canal to Roundham Lock at Kidlington, through the fields by Begbrooke and up from its church and priory to the fringe of Bladon Heath. Hence through Bladon with Churchill's grave (where our neighbour's son as a schoolboy years ago had the lucrative assignment of surveying tourist numbers, an exercise which brought lots of generous tourists' dollars to a cute English child), and back on the northern fringe of Oxford airport. Here two things were flying and I append a photograph of each. The two blurred ones - sorry - are a couple of the many Small Heath butterflies which were fluttering around, untroubled by the trainee pilots overhead. En route we also found this caterpillar. If anyone can identify it, I will buy you a drink at the Oxford canal-side pub of your choice (between Lower Heyford and the city centre). I hesitated before putting out the trap last night because rain was forecast, but out neighbours had grandchildren staying who were interested in seeing some moths, so we went ahead. I got up at 7am to the patter of rain and shifted the trap under cover but saw, to my relief, that it had several moths inside. The risk of introducing children to Mothland is that the moths may decide not to turn up, causing understandable frustration, boredom and resignation at the strange ways of grown-ups. Not so last night. We had plenty to examine - including, surprisingly for me, a couple of Cinnabars including the one above, which are better known as one of the UK's 60 or so day-flying moths. They duly flew off into the watery morning after several minutes of posing for the camera. Also there, was yet another member of the Prominent family, those aristocrats among moths. This, below, is the Iron Prominent, one of my favourites for its lovely colourway of maroon and that subtle, blue-grey, a sort of mixture of the uniforms of the American Civil War. There were three Swallow Prominents dozing too, one a Lesser SP whose small distinctions from the SP were spotted by the children's grandad. Also - below in order - this dainty Brimstone moth which took off and hid in the greenhouse, this Twin-spot Carpet (I think) and a pair of the lovely Least Black Arches which seems quite common here. Add a White Ermine, a Muslin, a Common Quaker, three Green Carpets and another black and white Carpet which I failed to photograph before it fluttered off, a large beetle, a maybug and several caddis flies and this was a satisfying haul. No tears or yawns then, and the children's Mum, a very cheerful and enthusiastic primary school teacher, is spreading the message too (having already bred butterflies from caterpillars in the classroom, a magical process if the children are lucky enough to see an insect emerging from its chrysalis). Another chilly night between pleasant days meant sparse moths: two Hebrew Characters, a Muslin, a Lesser Swallow Prominent - and this, which looks to my notoriously hopeless eyes like a Pale Pinion. I'm a bit hesitant, because this moth is categorised as 'local', ie halfway between 'common' and 'rare' or 'scarce' (before you get to the mysterious realms of 'Red Data Book', 'suspect' or 'doubtfully British'. Anyway, it will be interesting to have expert views in due course. It's the third PP in the last week, following the Pebble Prominent and the Pale Prominent; and there are plenty more in the category such as the Pretty Pinion, Pine Processionary and Plain Pug. I like the initials because they were and are used affectionately of my first editor who gave me my Guardian job, Peter Preston. Yesterday's sunshine brought Brimstone, Holly Blue, Green-veined White and Orange Tip butterflies to see us, and here is a female Orange Tip (the colour is sadly reserved for the male). Finally, I took a rather pointless picture of the trap last night, but finished up quite enjoying its image of a kindly light in the Oxfordshire dark. So here it is. It would appear much brighter to a moth,mind you, according to this interesting link. A flake or a twig? It was a surprise to find the trap empty of moths this morning, apart from a solitary Hebrew Character, given the sunny weather yesterday (nicely timed for the birthday of one of our neighbours) and a lovely start to today. But I see from the BBC Weather site that temperatures at night are still as low as 6C, so that may explain things. Not to grumble though, because there was another surprise - on the outside of the trap, where this extraordinary beast was snoozing. It's a Pale Prominent, looking just like the sort of length of Cadbury's Flake I used to get as a child in a family of four sharing; or a broken twig. Either way, another masterpiece of Nature's camouflage. There were two Americans on the bus with us out of Oxford today, discussing all manner of British issues, from the question of whether currency with the Queen's head would disappear after her death to the courtesy of buses to slow-moving cyclists wobbling along in front of them in the shared lane. Sadly, they got off before they had got on to the subject of our weather, because the last two days have shown its wayward nature in a classic way. Friday: vile, wet and so windy that the Cockney/Essex geezers who run Kidlington High Street's excellent veg stall almost had their canopies blown away. Penny and I held on to a couple of struts and got given a free ginger root in thanks. Today: so sunny and warm that we kept shedding clothing on a very enjoyable bike ride down the canal towpath into the city. The moths have mirrored this. Last night's chill resulted in just one visitor to the trap: a Green Carpet which fluttered off before I could photograph it. But when I was weeding late this afternoon, no fewer than three Green Carpets kept visiting me, flying by day as about 60 UK moths do. Eventually, I nipped indoors to get the camera and took the picture above. On the face of it, the little moth was perching on a grass leaf doing nothing, while a different and vast life-form got up close and personal and photographed it. But if you look closely at the pic, you'll see its curling proboscis. It was so busy licking the grass that it probably wasn't even aware that I was there. I'll just add a pic of a Goldfinch which preceded us along the towpath, just like a cyclist in a bus lane. We also saw Brimstones, Comma, Orange Tip and Green-veined White butterflies so it was a most rewarding seven mile pedal (even though I got a flat back tyre, which is why we came back on the bus). The weather is too uncertain to trap overnight at the moment and it's also gone chilly again; so even if the lamp were lit, there might not be many moths. Look, though: a moth has come to visit us indoors instead. Penny is the specialist at spotting these, maybe through some genetic superiority among women going back to ancient battles with the very few 'clothes moths' which damage favourite sweaters. She spotted it after the Ten o'Clock News, flitting around our sitting room. I got the first, rather poor picture then and had a sleepy and fruitless look through my Moth Bible; but shortly afterwards the insect ventured upstairs into our bedroom. I found a nice box and gave it a bedroom of its own overnight, before photographing it outside just now. It then consulted my micro-moth Bible and it seems to be the Large Tabby micro, Aglossa pinguinalis, although that is not strictly supposed to be flying until June. Maybe its larva pupated indoors in our new home where the temperature is more like June than it is outside. Large Tabby caterpillars also like eating cereal and we like Corn Flakes, Shreddies and Rice Krispies. I shall seek more advice and meanwhile hope that things warm - and dry - up. (See Dave's helpful comment; for once, I was right). The year's first hawk moth arrives - always a good moment. As was perennially the case in Leeds, it's a Poplar Hawk, a fine and curious-looking insect with odd twin habits of resting with its fat body curled up at the end and its wings back to front, like some sort of experimental aircraft. 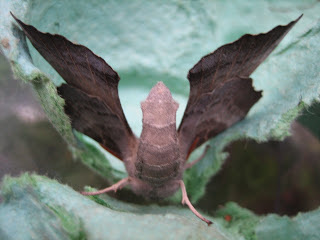 It formed the subject of my second post ever on the blog, back on 11 June 2008 when I published this particularly strange view of the first Poplar Hawk to come to my trap. Debuts since then have been as follows: 2009: 31 May, 2010 : 26 May, 2011: 26 May, and last year 2 June, which saw this unusually battered one, below, which got me speculating at the time about possible (but highly unlikely) hibernation. I love the dab of pink on the otherwise military-looking wings of the Poplar Hawk and the way that the antennae are white on top and pink from the side. Matching hindwings and antennae - like the woman my 94-year-old mother-in-law still remembers taking tea with her parents when she was a little girl. The visitor had a pink frock and Dilys asked her innocently: "Are your knickers pink too? ", those being the days of matching sets of such things for children. In Leeds we also had the Elephant Hawk regularly, the Lime Hawk occasionally (in both its varieties) and the Eyed Hawk just once. It will be interesting to see how Oxford compares. It has got off to the earliest start so far, and one of our nice new neighbours was telling me the other day about a very big moth they had in the house last year, which sound hawkish. So here's hoping. Also in the trap last night were the above: a dog-eared Bright-line Brown-eye and a Chocolate Tip with unusually restrained tip colours. It was one of seven, including the more standard one pictured just above alongside a Pebble Prominent. One last thing about all these moths: we were out late last night and so were they. I didn't light the lamp until after midnight. PS Check out Charlotte's amazing felt Poplar Hawk by following the link in her comment - thanks very much for that. Do you remember the Paul Simon song Cloudy? It's nostalgic for ageing hippies such as myself - and appropriate for last night's moths. Behold a Clouded Border, above, and and below, a Clouded Silver. The latter especially is a beautiful creature, with something of the Laura Ashley look which also reminds me like Cloudy of distant summery days. This one has had a bit of a battering and gone a little bald on the back of its thorax, but the patterning remains exquisite including the traces of dots on the abdomen. Summer this year is still in abeyance but it wasn't bad last night in terms of temperature, and the trap also had these arrivals, below. I've got to make an earlyish start today so will return to them later. I specially like the weevil/beetle and it's always a happy moment when the year's first May bug arrives and promptly falls flat on its back. I kindly righted this one. A Clouded Drab, methinks (but wrongly; Dave Shenton corrects me in Comments for which many thanks as always. It's a Rustic Shoulder-knot. Sorry). I think it's our friend the Red Twin-spot Carpet (Update: Martin Harvey suggests Common Carpet, not RT-s and again, I am sure he is correct). And is this a Yellow-barred Brindle? Um... (Update: but Banished suggests from the USA in Comments that it's a soldier beetle, which looks right. A redcap. Further Update: Martin Harvey identifies it as from the genus Cantharis, and quite likely Cantharis pellucida. Great thanks for expertise). I hugely appreciate the comments and corrections. Very many thanks to all four.